The 2016 DCI World Championship Finals began with some sick beats and quick feet at Drum Corps International’s fourth-annual DrumLine Battle, Saturday, August 13, in downtown Indianapolis. Although rain kept performers and spectators indoors for the first time since its inception, events unfolded without a hitch at the Indiana Convention Center. The competitive event allowed percussion ensembles to showcase their creativity while going head-to-head in a tournament-style bracket, with the overall winner in Indianapolis crowned the 2016 DrumLine Battle Champion. 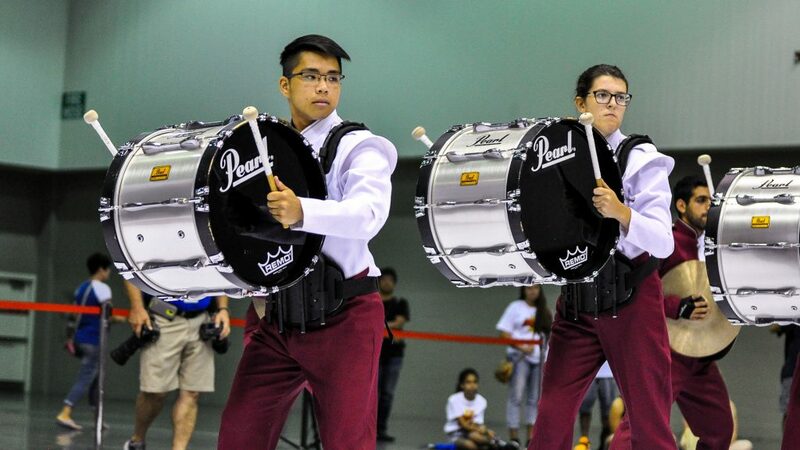 DrumLine Battle has seen significant growth since its founding in 2013, and during the summer of 2016, the event expanded even further as part of the rebranded SoundSport International Music & Food Festival presented by Motif Music. Featured groups in Indianapolis included the Diplomats, Shenzhen Conservatory, McMaster Marching Band, Pegasus Vanguard, Center Grove High School, Southeast Sound, and groups from DCI Open Class corps Gold, Raiders and 7th Regiment. Cheyne said that despite different backgrounds, she and her fellow members have easily made friends with other International groups and have enjoyed their third year doing so in Indianapolis. Mixed with the roar of the drums, several different languages could be heard mingling among spectators, who gathered to partake in an interactive drum circle during a break from competition. Lead for the second year in a row by the energetic Ed Gaus from Bongo Boy Music School in Castleton, Indiana, fans got to put their own rhythm skills to the test. Sponsored by REMO, the activity aims to bring a new level of appreciation for that which unfolds during DrumLine Battle competition. Each DrumLine Battle matchup is evaluated by three judges who focus on presentation, drumming and the overall battle. Technique and precision are considered important only as a tool to entertain the audience, whose reaction can have an influence over the final decision. The overall DrumLine Battle Grand Champion for the day was last year’s victor 7th Regiment, which threw down with Pegasus Vanguard from Hong Kong in the final round. Designed to be held year-round, DrumLine Battle events will continue throughout the fall and winter, with the next battle scheduled for September 17 as part of the 2016 Drum Corps United Kingdom Championships in Widnes, Cheshire, England. The DrumLine Battle competition featured three judges who evaluated the musicians on tehir percussive talents, stick tricks and audience engagement. The champion of the DrumLine Battle was 7th Regiment.